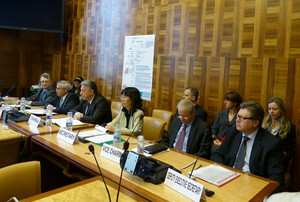 On 17 April EXCOM met and welcomed the new UNECE Executive Secretary Sven Alkalaj. In his welcome remarks, Ambassador Ugljesa Ugi Zvekic, Chair of the Commission and of the Executive Committee of UNECE, presented the main passages of Mr Alkalaj’s long diplomatic career, emphasizing his personal participation in the peace settlements in Bosnia Herzegovina, especially the Dayton Peace Accords, the numerous national and international recognitions received for his work on human rights and civil behaviour, as well as his career as a senior manager in the industrial sector dealing with many of the issues covered by UNECE activities. The delegations of EU, Germany, Turkey, United Kingdom, Russian Federation, and Switzerland took the floor to congratulate the newly appointed Executive Secretary and assure him of the full support of their countries. During his first 10 days in office, Mr. Alkalaj received several Permanent Representatives in Geneva: Ms. L. Mirachian, Italy; Mr. M. Tileuberdi, Kazakhstan; Mr. M. Maimeskul, Ukraine; Mr. A. Borodavkin, the Russian Federation; Mr. E. Aydogdyev, Turkmenistan; Mr. C. Strohal, Austria. In these meetings, the discussions called for strengthening cooperation between the secretariat and the member States in areas of mutual interest. Among the issues discussed, were transport, energy, water and the UN Special Programme for the Economies of Central Asia. Executive Secretary Alkalaj looks forward to collaborating closely with the UNECE Ambassadors and he confirmed his intention to improve communication both within ECE and with the member States.